Whether it is the row over Vishwaroopam or the scheduled visit of Salman Rushdie to Kolkata, state governments in both Tamil Nadu and Bengal have finally surrendered to Muslim radicals hawkish enough to stop those no matter what. While the wrangle over the film continues leaving Kamal Hasan dejected and seemingly outdone, Rushdie’s visit has been annulled by the Bengal government following warnings from the local police and political establishment, frightened of an Islamic outcry that may run amok both in Kolkata and other parts of Bengal. The victory rests with the Muslim radicals and their henchmen emboldening adherents of Islamic extremism across the globe. There is a limit to everything. While Pakistanis gloat to violate cease fire and murder brave Indian soldiers heinously (in a halal style) at every opportune moment, Government of India never forgets to exert its self-restraint and censure Pakistan diplomatically only at international levels. It never even think of confronting Pakistan militarily fearing to lose Islamic confidence in India. This is not possible for Hindus to withstand any longer. 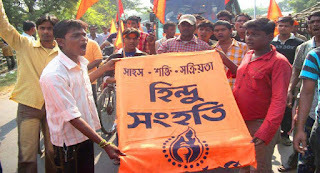 Brave Hindu youths in Kakdwip, headquarter of Kadwip subdivision in District: 24 Paraganas (South), preferred to think and act differently on January 23, 2013. They were found to kick and burn Pakistani flag to vent their anger against rising Islamic barbarity, expressed by Pakistan, and also the inaction and pessimism of Indian government. 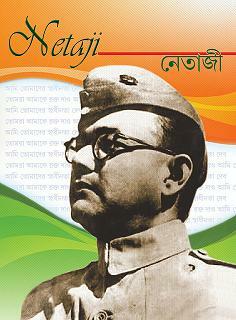 The band of Hindu youths was led by valiant activists of Hindu Samhati. Democracy in any nation doesn’t denote mere speeches or insensate services to indigenous people, especially people belonging to the lowest stratum of the society. Unless wretched people are bettered, there is no future. In contemporary India, dashing hopes of founding fathers of Constitution of India, this has been the trend; myriad instances are there to prove how political or social originations go on delivering mere speeches leaving commoners high and dry. No differences are witnessed on national holidays even; leaders who grace the daises continue doing the same while hapless people look on them helplessly. Hindu Samhati, ever since its commencement, has been against this pernicious mindset completely and the best instance of it remains distribution of garments, relief among poor Hindus whenever necessary. A perfect specimen of “Daridra Narayan Seva” as propounded by Swami Vivekananda a century ago. Thefts at Hindu temples are rampant throughout Bengal and with the indifference of police and administration, the number is rising overly. The grievous saga is not limited to any particular district but is extending far and wide. While a series of burglaries rocked Malda a few days back, now it is the turn of a Hindu temple in Bishpur Majherpara, a village under jurisdiction of P.S. Hasnabad, District: 24 Paraganas (North). The village is known for the Kali temple of Manimohan Memorial Trust far and near. And that temple was targeted on January 25, 2013 at dead night. It has been learnt that valuables along with gold jewelries worth Rs. 1 lakh has been stolen. An official complaint has been lodged by Manimohan Memorial Trust; police is yet to get the culprits. In Muslim majority Bangladesh beef is in high demand. More than 90 percent of the 160 million people who live there are Muslims and for them beef is a delicacy. 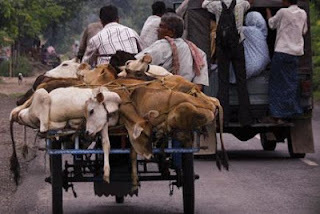 More than 2 million cows are smuggled from India to Bangladesh every year and most of the illegal trade takes place through the Indian border state of West Bengal. Bangladeshi slaughterhouses cannot source even 1 million cows from within the country. If Indian cows do not reach the Bangladeshi slaughterhouses, there will be a big crisis there. Hindu Samhatir Dake 14 February Kolkata Chalo !!!!! Not even a day passes in the realm of Jibantala, District: 24 Paraganas (South), when Muslim ruffians miss a chance either to malign Hindus or injure them directly. Even after lots of pleas to the local police and administration, the situation remains same and how the same Muslim assailants roam freely with police personnel are perceived almost daily. Hindus, after being betrayed a lot, have decided not to give in and struggle till the last. This mantra propounded by Hindu Samhati has been influencing Hindus substantially; their desperate struggles in every corner prove the same. The village of Middeypara, under jurisdiction of Panchayat: Atharobanki, P.S. Jibantala, District: 24 Paraganas (South) remained witness to such a flare-up on January 21, 2013. The problem that was intensified with the sudden and fierce attacks of Muslim radicals on Hindus was calmed down by Hindus responding with same fury and vigor finally. Hindu persecution in Bangladesh remains unabated and apparently there is no reason to dream that this festival of the masses to persecute Hindus would end before long. It has been going on through ages in every capacity leading to the desertion of Bangladesh by Bengali Hindus silently but steadily. From making 29% of the entire population in East Pakistan in 1948 Bengali Hindus have come down to mere 9% in modern-day Bangladesh and the same number is also on the wane. While on one hand Islamic state structure must be censured severely, Bengali Hindus can’t also evade their own responsibilities. Hardly Bengali Hindus during both Pakistan and Bangladesh periods have dealt with practical politics. Neither have they mulled over the need to fortify their own defenses nor have they supported humanitarian groups working in Bangladesh in throngs in broad daylight. Will Hindu Temples in Malda Cease to Exist? Hindu temples in Malda, premier district in Bengal, have become latest target of burglars and with each day it passes, more and more temples are becoming victims to theft while the administration continues to witness the horrid episode helplessly. Only on the night of January 22, 2013, four temples became victims raising the number of thefts to 12 in the last 4 days. Who is behind this wicked design? Even if police and administration appears to remain innocent, substantial evidences prove that Muslim radicalism is being given a free rein in Malda. And it has become stronghold of illegal Muslim immigrants from Bangladesh by and large. All these factors stimulate Islamic fundamentalism to raise its head posing a grave threat to Indian integrity fast. Hindus temples in Malda have become the first casualty of Muslim radicalism, hence. When on earth Hindus remain united and fight with vigor, they have the taste of triumph; this has been the lesson of history and Hindus inhabiting the village of Gagramari, P.S. Basanti, District: 24 Paraganas (South) are having it at the moment. 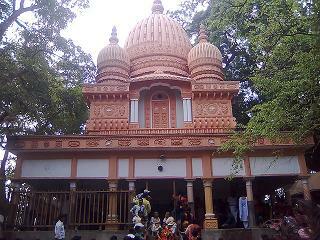 Defying the threat of Muslims, hundreds of Hindus of Gagramari, led by Hindu Samhati’s activists, went to the temple of Shitala Mata on January 13, 2013 and performed Puja with splendor. Not a single Muslim dared to interfere. 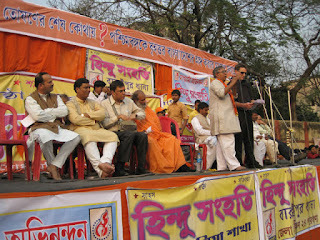 On January 13, 2013, Hindu Samhati organized a street corner meeting at village: Fulbari, P.S. 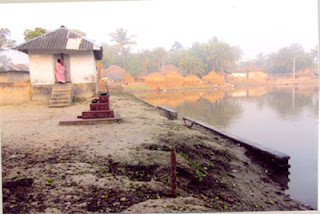 Minakhan, Subdivision: Basirhat, District: 24 Paraganas (North). The meeting was presided by Rahul Bhuiyan, Debasish Chakraborty and Biplab; more than a hundred of Hindus joined the meeting. 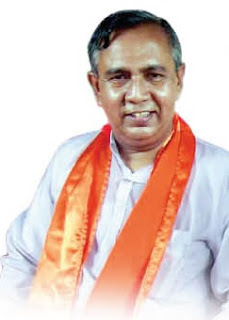 While speaking on the meeting, Sri Brajen Ray, vice-president of Hindu Samhati, narrated how Muslims throughout Bengal are exerting pressures on the state government relentlessly to have their own demands. Hindus, to end this burgeoning crisis, have got to rise up, be outspoken and come under a single fold despite differences, whether political or any other. Hindu Youths of Bagnan-Patinan Fight Back And Succeed Despite Heavy Odds ! The tension between the two villages under Bagnan Police Station of Howrah district, the Hindu majority Patinan and Muslim majority Khajurti, has a long history. Islamic fundamentalism had been proceeding stealthily at Rampurhat, District: Birbhum in Bengal and now it has become apparent with the savage assault on Dr. Achintya Kumar Chakraborty, aged, revered Hindu doctor in the neighborhood, by Muslim radicals. It has come to knowledge, eve teasing of Hindu girls and women by Muslim youths (crossing all limits of decency) has become rampant in the area. A girl student of Class VIII in Rampurhat Railway Adarsha Vidyamandir was being teased for a few days at a stretch. On January 18, 2013, she was teased indecently once more by Imtiaz Sheikh and Babu Sheikh that made her inform her own relatives. Without wasting a single moment, they came to the school and caught the two Muslim teasers red-handed. Hindu women in the area thrashed the two Muslim teasers as well. Two startling thefts at two Kali temples in village: Hedia, P.S. Jibantala, District: 24 Paraganas (South) have rocked Hindus living there. The venerated temples, existing there for decades, are visited by Hindus regularly to perform Puja and are also regarded as stronghold of Hindus living in the village and its neighborhood. Along the lines of conventional Hindu beliefs, jewelries (of both gold and silver) are donated handsomely by Hindus; a fact known to all in the environs. Nevertheless, Hindus (depending on God’s grace much) didn’t feel it necessary to fortify the temple’s security and taking advantage of the same, the nefarious design to rob the temple and also to implement it perfectly took place on January 1, 2013 at 2 am. It has come to knowledge, diadems of Goddesses worth 1.5 kg, jewelries (of both gold and silver) worth 30 gm., utensils made of brass and bell metal have been stolen. 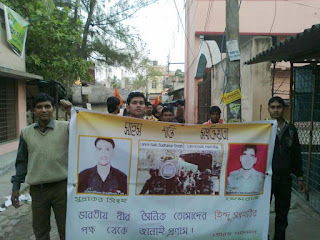 Hindu Samhati’s valorous commemoration of 150 th birth anniversary of Swami Vivekananda has stirred different parts of Bengal at the same instant and the prime of it became apparent in Bagnan, Howrah on January 12, 2013. People in throngs were found both to appreciate the endeavor and paying floral tributes to pictures of Swami Vivekananda and Indian soldier martyrs. Hindu Samhati, to commemorate 150 th birth anniversary of Swami Vivekananda, organized programs at different places across Bengal and Bele Durganagar High School field, P.S. Joynagar, District: 24 Paraganas (South) remained witness to one such. Pather Dabi is a humble village in the realm of P.S. Hingalganj, Subdivision: Basirhat, District: 24 Paraganas (North) and remains Hindu-dominated up to now as well. But this reality has failed to prevent Muslim strong-armers even; 10-15 Muslim households living there coupled with their external supporters rule the roost at the moment. The Hindu-majority village has witnessed cow slaughter for two successive years – 2011 and 2012. However, Hindus in the village built up a massive defence against cow slaughter during last Eid in 2012 and waged the combat against both Muslim malefactors and their administrative bosses for days. But Muslim culprits didn’t stay silent; scores of Hindu houses were destructed in reply while the administration preferred to retain a strange silence. Pather Dabi is apprehensive of untoward developments in this year too; each and every struggle intensifies Hindu confidence. Hindus refuse to leave a single post in the ensuing struggles. Then and then alone you are a Hindu when the very name sends through you a galvanic shock of strength. Then and then alone you are a Hindu when everyman who bears the name, from any country, speaking our language or any other language, becomes at once the nearest and the dearest to you. Then and then alone you are a Hindu when the distress of anyone bearing that name comes to your heart and makes you feel as if your own son were in distress. 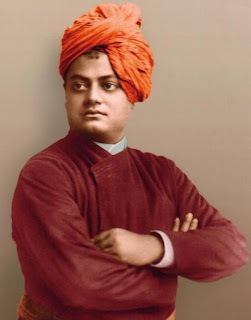 Thus spoke a person whose appearance, presence and works not only galvanized Hindus but helped them to come out of a thousand-year old slumber under the sway of Islamic and British imperialisms – he is none other than Swami Vivekananda. Swami Vivekananda, in brief, appeared at a time when Bengal Renaissance was in its full might, nurturing every young and subtle Hindu youth but definitely the consciousness or pride of being a Hindu happened to be the first and foremost casualty. Laws for Hindus only! Not for Muslims! Two forms of laws are getting apparent in length and breadth of the Indian state of Bengal; while every sort of harsh law is being enforced against Hindus, minority community, virtually Muslim, is being given exemption (in every capacity) regarding same offences. This is not any baseless claim – a musical soiree (jalsa) was organized by Muslims on January 1, 2013 at Kalasbazar, Block: Magrahat, District: 24 Paraganas (South) throughout the night flouting all civilized and legal norms. Even if the gathering left sufferings for people in the environs, especially for patients, police remained silent despite repeated pleas. And the painful experience continued till 4am in the morning. Law and order was raped once more.